Now after 54 years, one of the most fascinating unsolved US historical mysteries of all time will be returning to the silver screen with an Award Winning screenplay and original story that follows the infamous Escape from Alcatraz by three men on June 11, 1962. Seattle Producer Scott A. Capestany of Capestany Films negotiated earlier this Spring at the 2016 SCRIPTFEST in Los Angeles, a screenplay option deal with book author Kevin Bruce. Bruce, whose father J. Campbell Bruce penned the original book “Escape from Alcatraz” that was converted into a movie starring Clint Eastwood in 1979, recently completed his screenplay adaptation and became a 2015 Cannes Film Festival screenplay finalist in competition. Capestany Films has been gaining much attention with numerous industry insiders over the last few years involving their aggressive campaigns designed to bring new large scale Film/TV productions to the Pacific Northwest. Capestany has been strategically positioning his companies IP that includes current projects in development and production mirroring the efforts of Washington Filmworks who have been fighting to restructure the current film incentive program. Currently, the incentive program ranks at the bottom of over 30 States in the union whom offer spectacular and appealing rebates and tax incentives for producers filming in their regions. 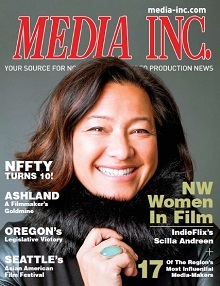 At this years 2016 Seattle International Film Festival, Executive Director Amy Lillard accepted an award for Washington Filmworks’ hard work over the years and helping to restore WA State as a premier filming location that could offer better incentives for their filmmakers which in turn positively impact the States local economies. With their new project ‘After Alcatraz – Surviving the Escape’, Capestany and his team plans on bringing a large portion of the film to a small Pacific Northwest community that will feature a magnificent 1960s production design, theme and one of the most popular prison escape stories of all time to Washington State. “Having watched Scott work tirelessly over the years, re-opening the Alcatraz mystery – so to speak – and bringing this tale of intrigue and history to the Evergreen State soil could be the kind of film that helps put Washington State back on the map as a prime and economically viable filming destination.”, said local production designer Aaron John III. The producers did not comment on or speculate if Clint Eastwood would reprise his role of the aged 85 year old escape Frank Morris or speculate the possibilities of Scott Eastwood to play the lead part of the younger Frank Morris in this film.